When I told people I was going to Quito, Ecuador with Kids, I heard mixed reviews. A lot of people mentioned issues of petty crime, it kind of put me off. If anything I’ve learnt from this, I need to go and make my own mind up about a place. We were really surprised at how family orientated Quito is! 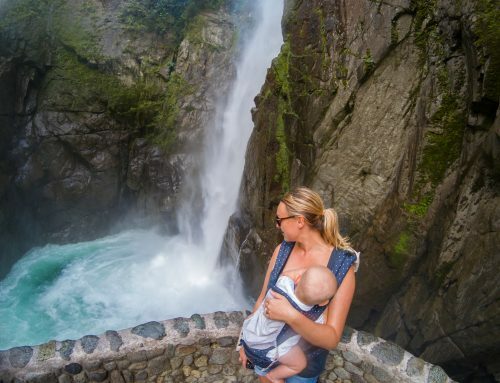 It’s literally one of the most child-friendly places we’ve visited on our Pan-America trip. There are so many interesting museums, not to mention the playground on nearly every corner. As cities go, Quito is very beautiful. It’s surrounded by imposing green mountains. The valley is filled with skyscrapers, whilst the colourful old town is stacked up on the hillsides. Yellow taxis, similar to those in New York, buzzing around the streets and coffee shops galore, give the new part of town a modern feel. It’s a striking difference to the old town. We found the locals wear traditional attire in the old town. Woollen shawls, skirts, tights, little ankle boots and the original ‘Panama hat’. At 9350 feet, Quito altitude is something to be kept in mind. Like I always say, its important to have good travel insurance. Other than my mild headache on day one, none of us had any issues, but everyone responds differently. With it, comes steep drives and a need for a good car. We had our rental car with us and although it wasn’t a big 4×4, it managed the incline really well. Interestingly, they have a driving curfew at certain times in the day. In that case, we took an Uber which was only a couple of dollars for a long enough journey. That said, its also worth noting, we found local drivers to be quite erratic! 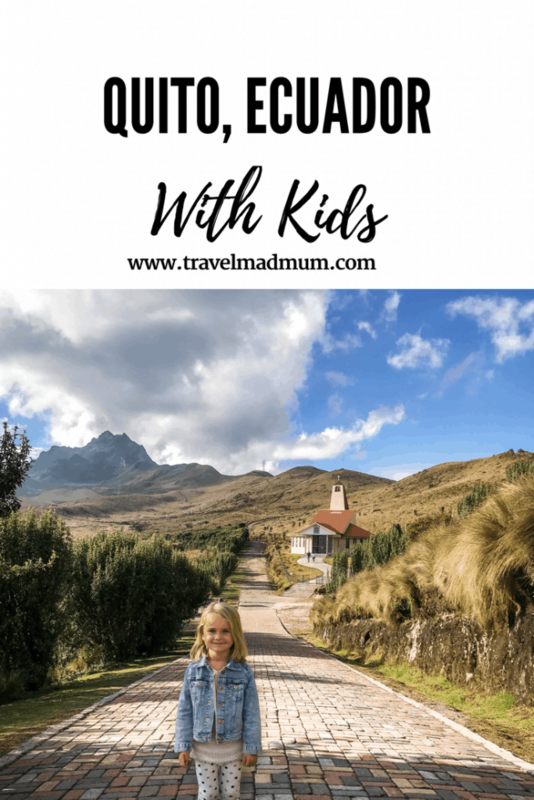 In our usual format this is our play, sleep and eat guide to Quito, Ecuador with Kids. 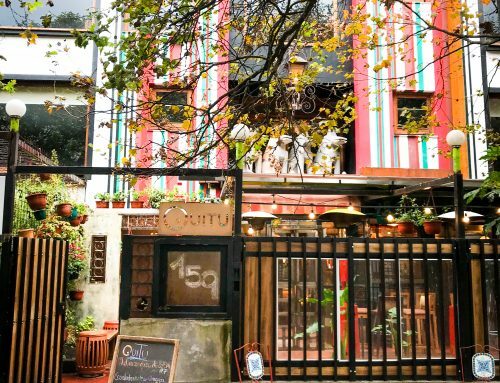 There is no shortage of things to do in Quito. I would say a minimum of four days to see all the highlights comfortably is necessary. We were staying in a good location, not far from Parque La Carolina. It’s such a fab spot with lots going on. There are several different play grounds for the kids, an old aeroplane, outdoor gym and lots of street vendors. Within Parque La Carolina, is the botanical gardens, definitely worth a visit too They are at the West end of the park, you can’t miss the giant frog outside. Entry to everything in Quito is super affordable. No more than a couple of dollars per adult and kids under three generally go free. 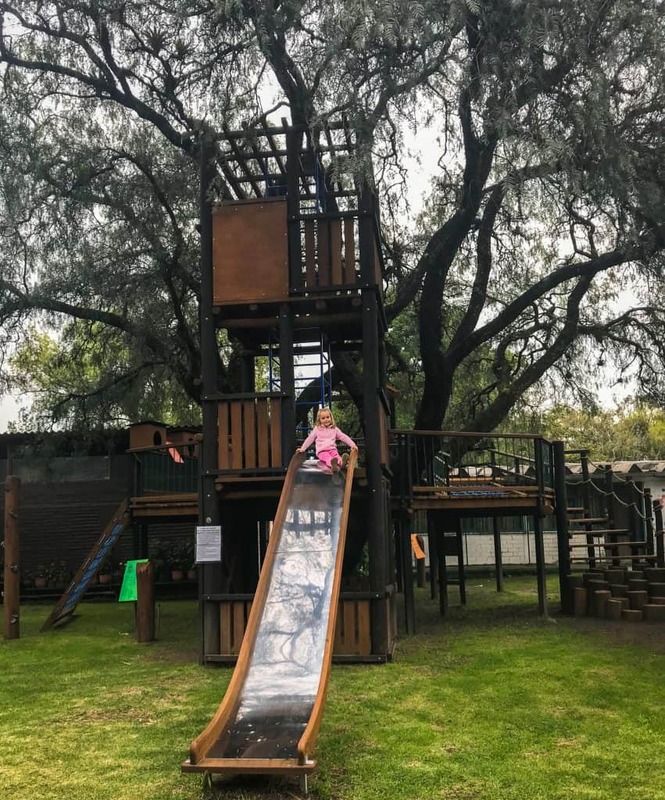 There is an amazing tree house style playground inside that will need at least a couple of hours to explore. The walk around the gardens is super relaxed. Yaku Water Museum was one of our favourite places. Based on the top of the hill, near old town, it had spectacular views out over the city from it’s completely glass building. There was so much for the kids, from the room that you can make giant bubbles, to the life-sized snakes and ladders floor game. We had a great morning playing around with all of the interactive stations. If you arrive from the car park on the lower floor, make sure to have your camera at the ready as you ascend to the entrance in the elevator. The views are epic, it’s literally like something out of a movie as you go up into the air. Next up in the awesome museums was Nik Cimenatic, probably our three year olds favourite. 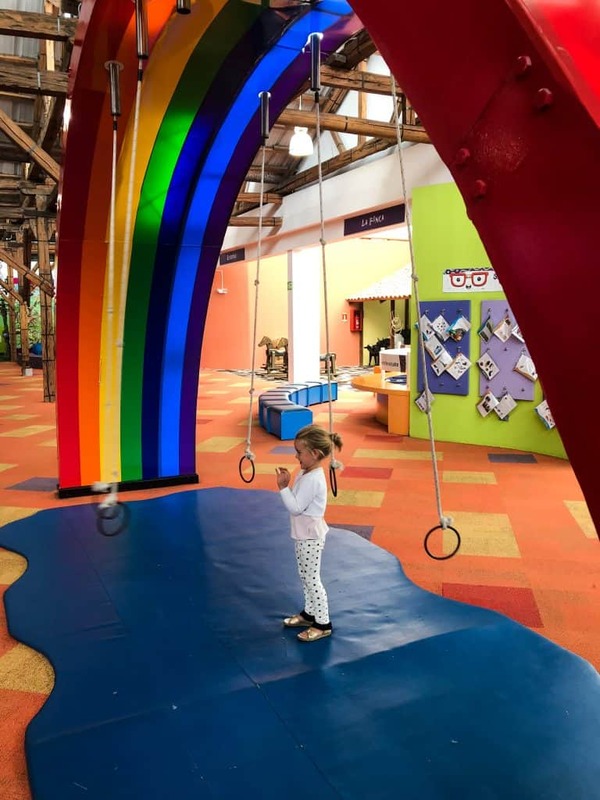 This museum is set up to teach kids how a farm runs, where different animal product comes from, fruit and vegetable store and lots of different play spaces. There was a series of small slides ending in a ball pit surrounded by native stuffed animals, sounds weird but was actually super interesting. Our seven month old baby loved the music station complete with xylophone, drums and tambourines. They also had a make believe office for kids to practice using it as a working environment. The show stealer was the flying eagle, yes you heard me right, not a flying fox! 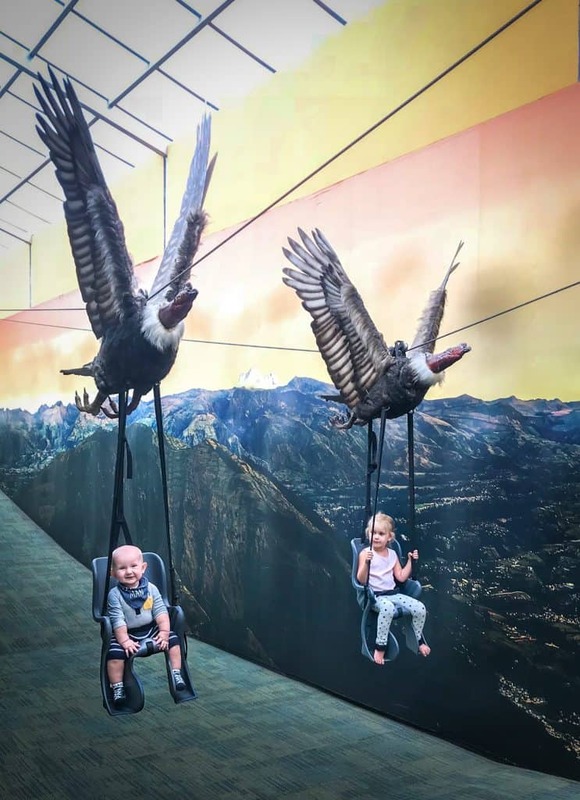 They have a long hall with two cable swings that look like they are being carried by giant eagles. We had a lot of fun playing around on them, especially as we had the entire museum to ourselves. 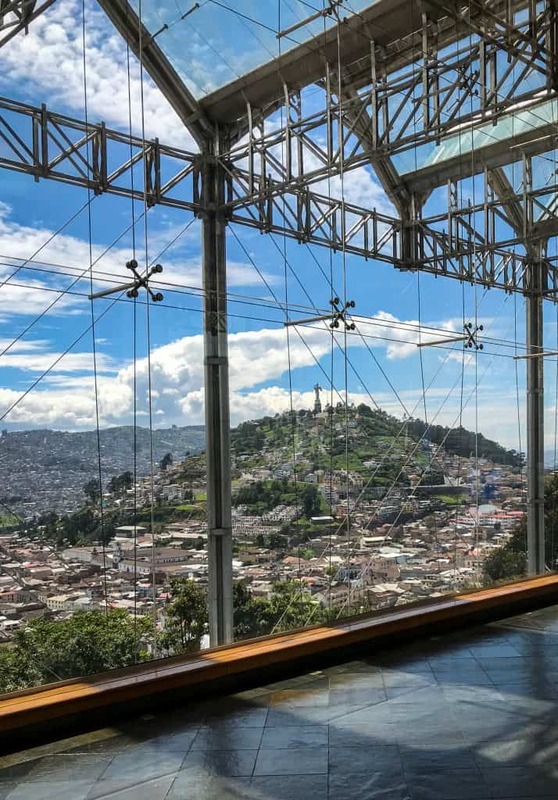 Quito cable car, The Teleferico ascends to a whopping, 13,280 feet above sea level. It’s the highest cable car ride in all of South America. I think we underestimated the sheer height of it and when we turned up, they wouldn’t allow us to take our baby up just in case of breathing difficulties. Baby has to be older than eighteen months old to go up. I hung back and had a coffee whilst Esme and Shaun went up. The ride is around eighteen minutes to the top and the views on a clear day of nearby Andean peaks are outstanding. Its like complete wilderness, almost like another world as you can see from the above photo. We stayed around a twenty minute drive from Quito old town. It has a traditional feel in comparison to other parts of the city, with an imposing cathedral, bustling town square and historical buildings. We had a wander around the streets, looked inside the churches and ate the yummiest cheese and fig sandwich with a coffee in a cute little place off main square. Make sure to check out Dulceria Colonial, they are really friendly and welcoming family. Funnily enough, it was the owner of this cafe that kept warning us of pick pockets in the area. I guess he sees it every day so its worth keeping it in mind. We stayed at Hotel Finlandia thats situated around the business district. It was in a good central location to reach many of the attractions. 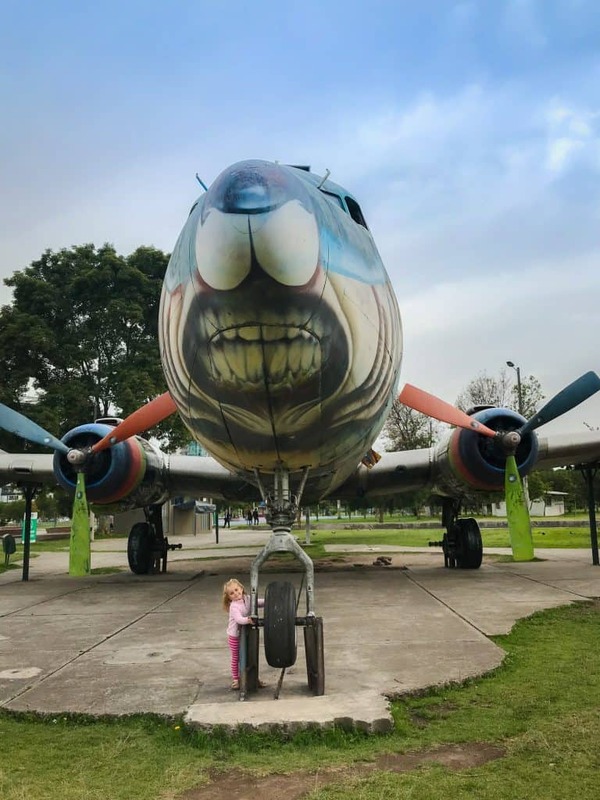 We loved that it was right next to La Parque Carolina as it was so easy to bring our little girl to the playground. Another thing we really needed was secure parking! Luckily they had an underground facility which is hard to come by in Quito. Our room had a large double bed and a single bed for our little girl which was perfect. The beds were super comfortable and really big, perfect when the little ones wants to be in beside us. 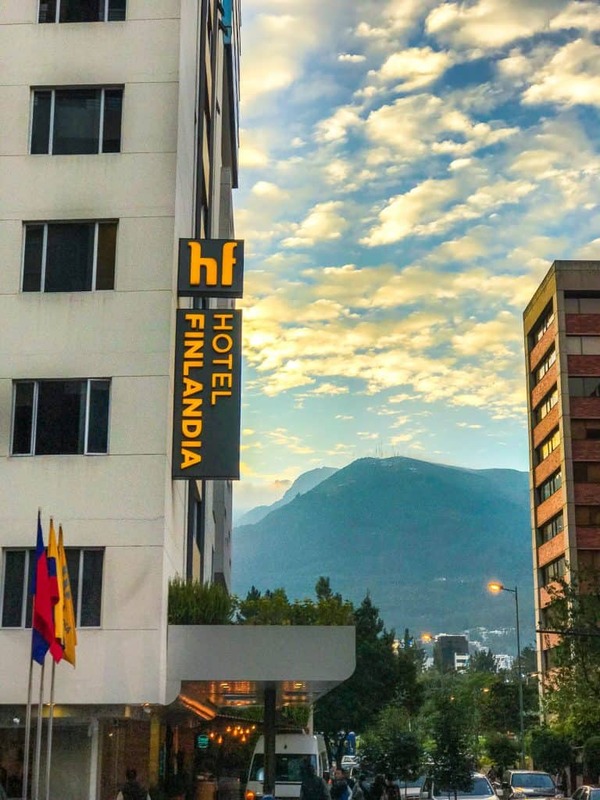 Quito was a little cold when we were there and Hotel Finlandia felt super cosy. They left us fresh water daily and breakfast was also included in our stay. It had a great selection of fruits, papaya, pineapple, strawberries and grapes. They also had traditional warm food, bread, pastries, coffee and juice. We felt set up for a day of touring after it. The restaurant was also open for lunch, dinner and coffees throughout the day. As it was cold in Quito, the traditional Ecuadorian potato soup went down nicely in the cozy environment. The windows in the room are a little small and whatever way we were facing, it seemed there was some noise late at night. It didn’t bother us too much but I think it would a not be so good for a light sleeper. FOR RATES AND AVAILABILITY USE OUR AFFILIATE LINK HERE. We were super busy trying to squeeze in as many of the sites in our three days in Quito. We found ourselves eating at the hotel a lot but we did find one really good restaurant that I will tell you about. We found a really nice restaurant, Quitu Itendidad Culinaira. It was pouring with rain on the day of our booking and the restaurant had the log burner going, mood lighting and cozy soft furnishings. It was the perfect place to hide away from the horrible weather. 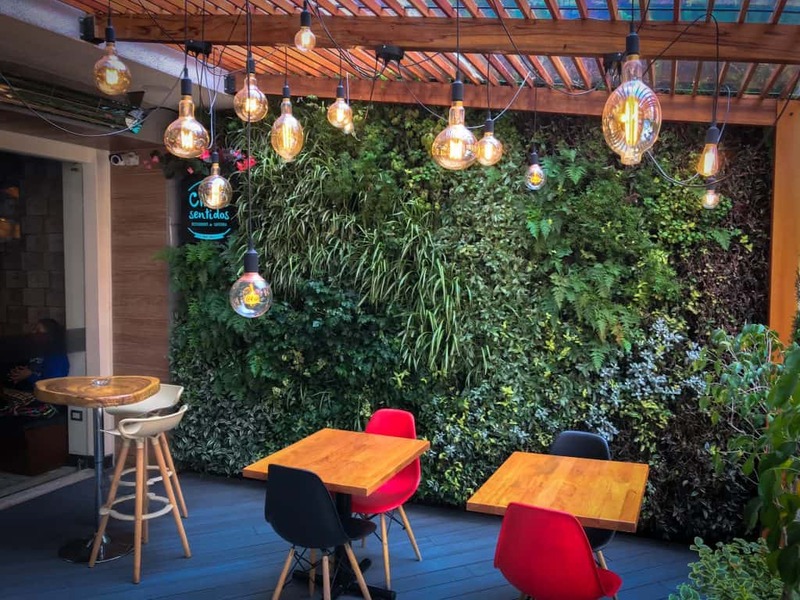 Owned by an Ecuadorian chef Juan-Sebastian, he has travelled around the country working in many different places, collating traditional skills, recipes, ideas and put a modern, fine dining twist on them in his own menu. 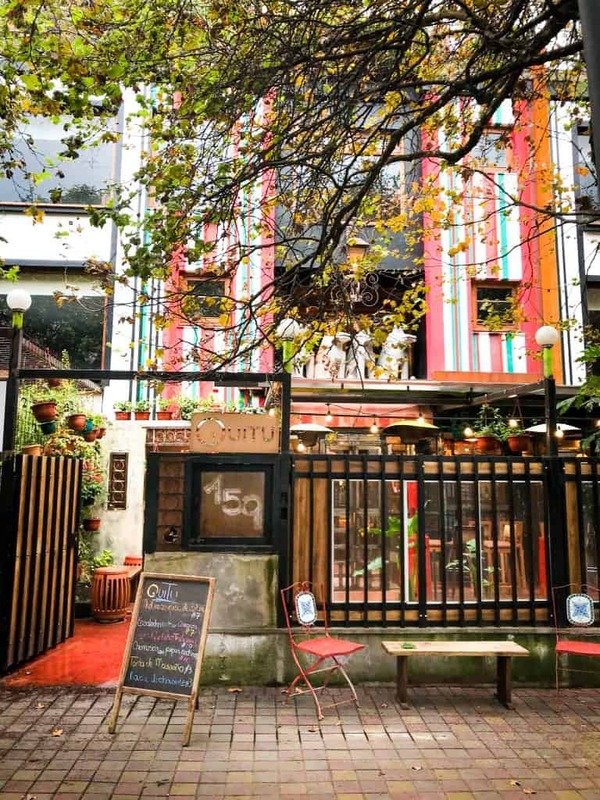 We found Quitu Itendidad Culinaria on Trip Advisor, it’s a highly recommended restaurant in the area. 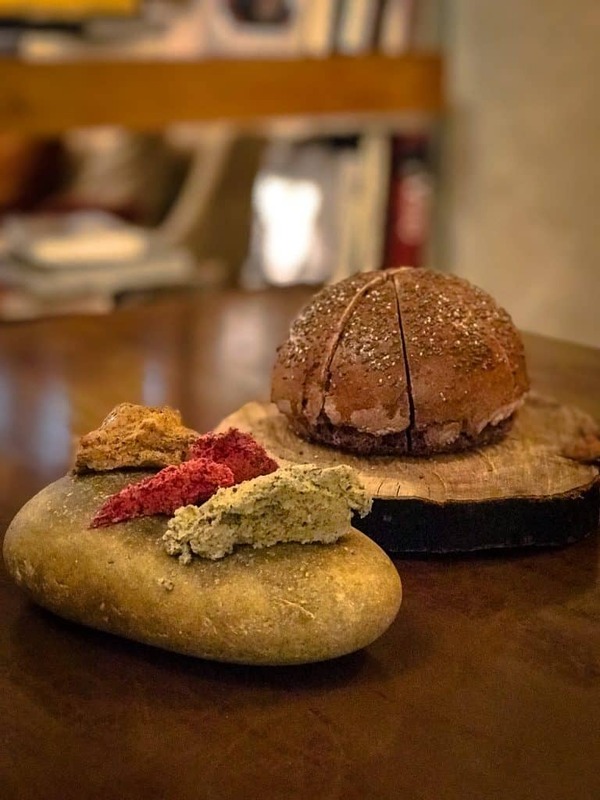 They have a tasting menu that changes daily. It tastings can be served alone or paired with a drink. The menu is very reasonable, making it a worthwhile experience. We felt at home their with the kids, especially with the cozy and relaxed vibes. We always go for an early dinner in that situation just to save any melt downs when others are trying to enjoy the experience. To read about our full write-up click here. 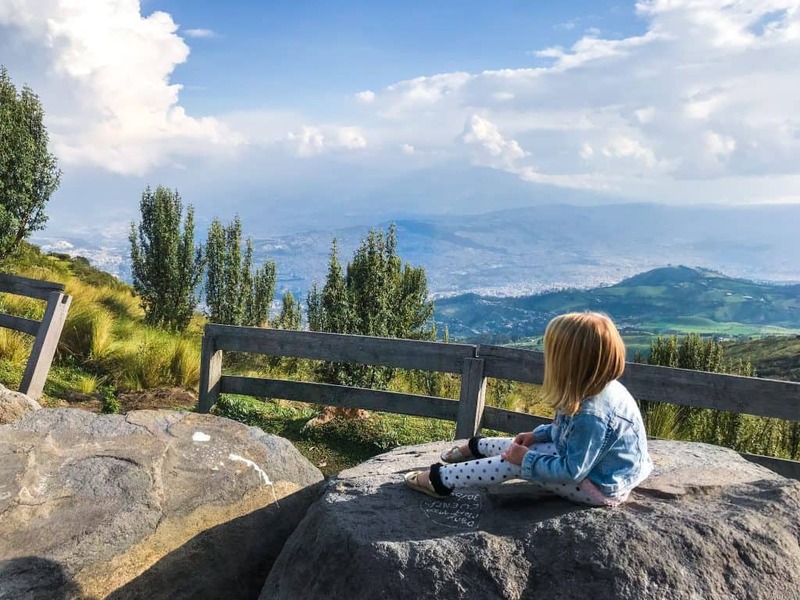 Have you found Quito, Eduador with kids useful? If we’ve helped you in some way, we would love if you could help us too. In this digital age there is a demand for immediate information online. Being a patron is a new-age way of giving a small token of appreciation for this information, which takes time to put together, with no financial return. We offer exclusive access to blog posts before they are published as a thank you. We also offer travel advice and consultancy at different payment tiers. You can sign up to our Patron program here. Disclaimer: There are affiliate links in this post. Read my explanation of what an affiliate link is here and how it helps us. 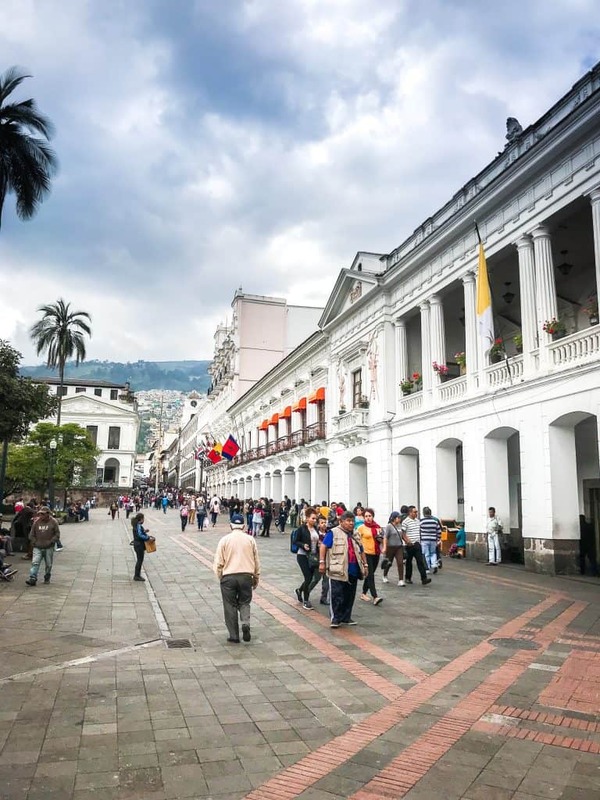 Some of our adventure in Quito was complimentary in return for an honest review. As always, all views expressed are entirely our own. I couldnt find any information about Nik Cinematic Museum in internet. Are you sure the name is correct? Thank you so much for this incredible and reassuring article. 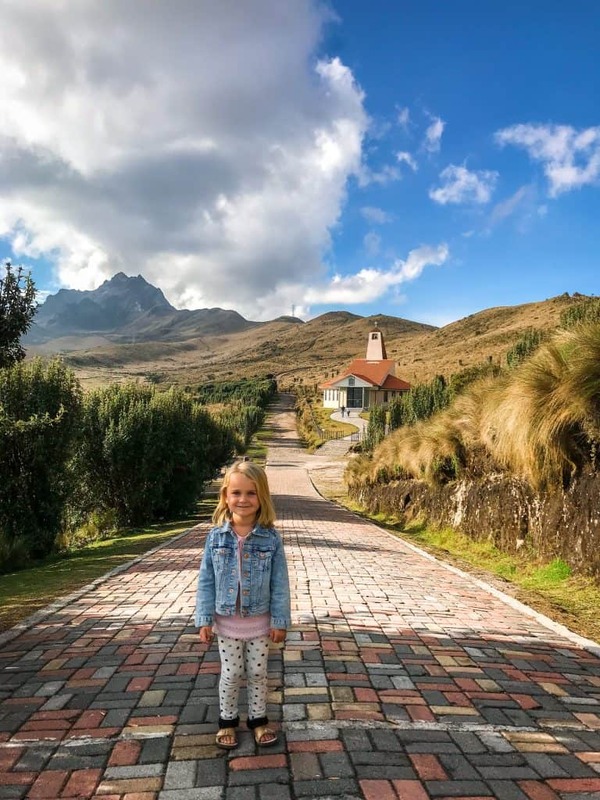 We booked flights to Quito with our 3 year old and six year old, and I was starting to second guess myself. Hi! We can’t find anything about the Nik Cimenatic museum on the Internet. Can you tell us how you found it, and what area it is? We’d love to go! The reason you couldn’t find the NIK information online is that the Museum is called MIC (Museo Interactivo de Ciencias). Located at Calle Sincholagua y Maldonado. Saludos! What time of year did you go? We are planning to take our 4 year old and 16 month old next summer. Would you say it is easy to get around with a stroller? Or would you recommend no stroller and just child carriers? Hi the weather in Quito is the same during the year, sometimes its sunny sometimes rainy, thats it. Come its great for kids!